This past weekend was a disaster. I made a brioche, but I didn't bake it for enough time, so it was raw in the middle. I also made bread and I wanted to post it here, as many of you ask me to post bread recipes on my blog. Well, it's going to have to wait because I forgot to add salt to it, and there is nothing worse than a bread without salt. Last night I made one of my favorite family recipes, stuffed zucchini with bechamel sauce. They were delicious but I forgot to take pictures. As you can see, a total disaster. There is only one thing I didn't fail at, and that is this beautiful raspberry sorbet. Rachel gave me an ice cream maker for my birthday. Yes, that is right, an ICE CREAM MAKER! Are you jealous? So this was my first attempt to make ice cream, just when the weather was asking for it. It's not OK for me to say that it was really good, so I won't say it. Just imagine it yourselves! A few tips on the recipe. I made it with frozen raspberries because they cost half as much as fresh raspberries. Also that reduces the time they need to chill before putting them in the ice cream maker, as they are already pretty cold after thawed. 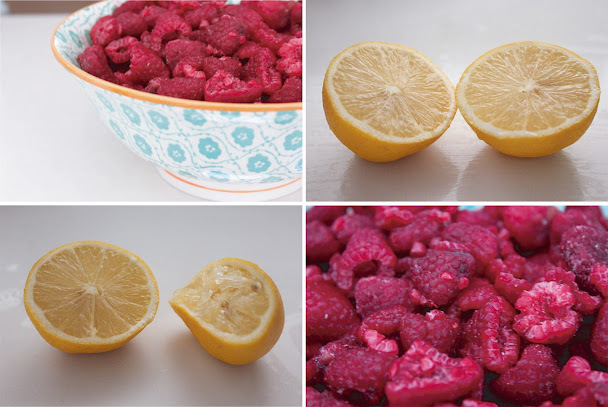 When I put them in the blender, I added the water too as the blender wasn't working with just the raspberries. I made the simple syrup with light corn syrup. 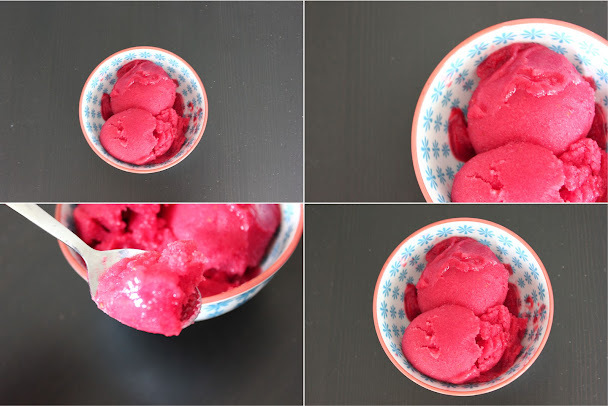 Using corn syrup or glucose prevents the water from crystallizing in the freezer, giving the sorbet a better texture. Other recipes only use sugar and water, so I guess you can try without the corn syrup if you can't find it (in Spain it is hard to find). Stir the water, sugar and glucose or corn syrup in a saucepan. Bring to a boil and let it boil for a few seconds. Remove from heat. Let it cool thoroughly. Use a food processor or an electric blender to liquify the raspberries. Strain to get rid of the seeds. Combine the raspberry juice, simple syrup, water and lemon juice in a bowl. Refrigerate until the mixture is cold. Process in an ice cream maker following the manufacturer instructions. When finished, transfer to a chilled container and store in the freezer for a couple hours before serving. Hi, I like your new front page, and every single photo. This sorbet was freaking amazing. Perfect after Padden and I went for our hungover run.